I thought this was an unusual sight, an outdoor cafe next to a cemetery. This is in the cemetery at King's Chapel. It is unusual, but when I clicked on the photo, the people at the cafe seemed quite content. 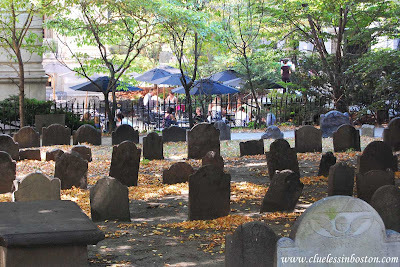 The oldest burial ground in Boston. In much better shape than Copp's Hill. Unusual but peaceful. Great photo.